Beautiful River Front Condo 1 HUGE Bedroom/2 Bath with PRIVATE DECK overlooking the Chattahoochee River. Perfect if you are wanting to stay directly DOWNTOWN. Park your car for FREE & spend the rest of your time site seeing & adventuring! Enjoy EASY and QUICK access to downtown Helen, Ga. This cute condo has everything you need for your comfort & style. 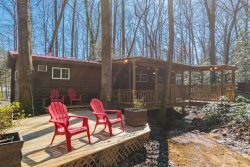 Perfect for groups traveling together as there is a condo right next door that is also managed by Blue Creek Cabins. You will love the river down below for swimming, fishing, tubing & more. Also, you have access to the park that is neighboring the condo! Enjoy quick and easy access to ALL of what Helen, GA has to offer such as Tubing, Golf, Games, Shopping, Fest-Hall, Bars & delicious restaurants within WALKING DISTANCE like Big Daddy's Tavern, The Loft, Spice 55 - Tai & Sushi, Bodensee Authentic German Cuisine & MORE. This is NOT a pet friendly condo. Free Parking! 2 Spaces located below the condo building. Wash & Dryer NOT INCLUDED. Laundry Mat is located within short walking distance. There's a laundry mat short distance from the building. The guest services team was very helpful sent us directions to condo & check list on how to sign in & out. Enjoyed our time in Helen. Very neat and organized. Property had every convenience beautiful view of river.